Dropped items update: Beer, Cake and Sushi? A while ago, we’ve posted an overview of the dropped item meshes that are available in the DevKit. When we currently drop an item in ARK: Survival Evolved, you’ll see a bag regardless of what you dropped. The devs are working hard to create meshes for each type of item, so that you will be able to see what has been dropped. When looking around in the latest DevKit version, we came across some newly created item meshes that we wanted to share with you. 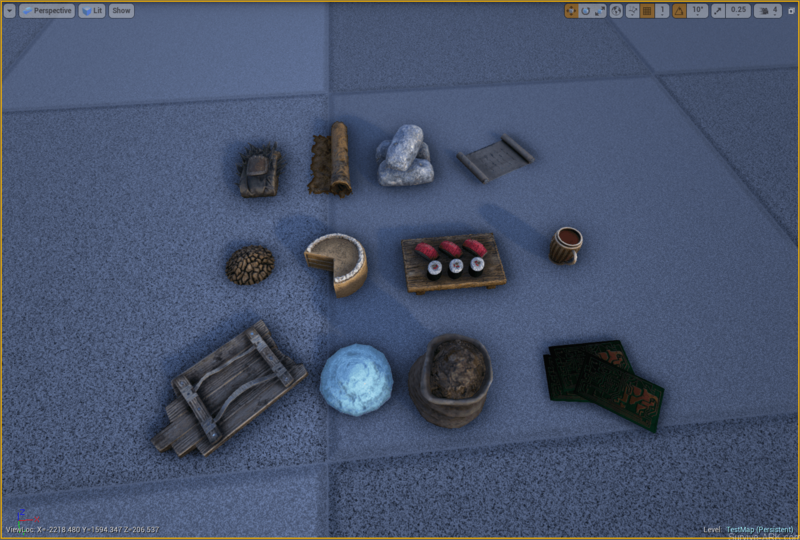 Some of the new meshes include Beer, cake and “fancy food” (which looks like sushi to us), an indication that more types of food are coming to ARK? It is a very minimal preview, but if you guys want to see the meshes from up close or from different angles, just leave a comment and we’ll add more. Next Post: Patch v232 – What’s New? Devkit Preview: Daeodon, Hyaenodon, Thylacoleo, Lamprey (unknown), Scissors weapon and much more! ARK: Survival Evolved coming to PS4 this December!